I love pickled eggs so much. I was first introduced to them when I was young, by a friend whose mom pickled her own. I thought it was so romantic—going down to a basement and bringing up a bottle of home pickled eggs. For some reason it took me 10 years to try it myself. This summer, I found a small-scale, sugar-free recipe for pickled eggs in Putting It Up With Honey, gathered some eggs and...waited another two months. 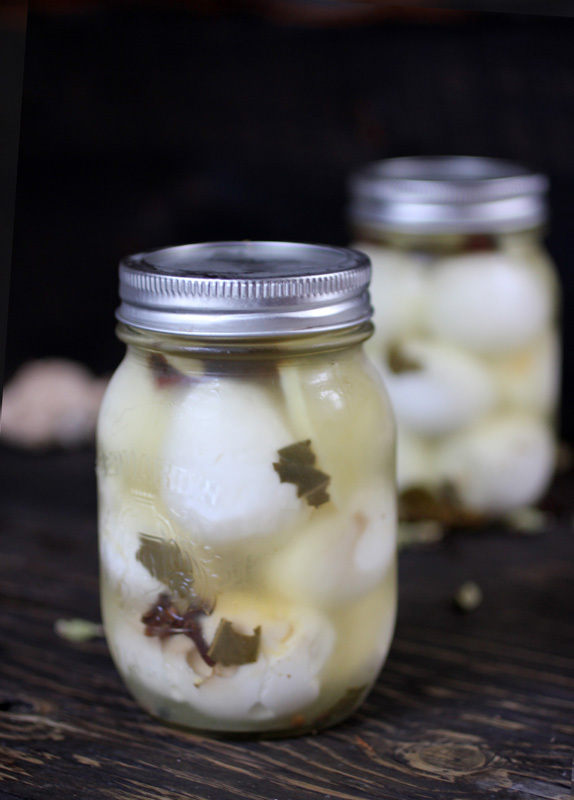 I finally made my own pickled eggs this Fall and I took as many precautions as I could to avoid killing myself and my family with poorly pickled products. I sterilized everything and bought pickling vinegar and salt. I used mini eggs from my mom's friend because I read that smaller eggs are safer, as they are more easily penetrated by the preserving powers of the acidic vinegar. Also, I always kept the finished product in the fridge, no matter how crowded it got. My ideal was to be able to store my pickled eggs in my basement for months and months, like my friend's mom...but, in my research I found recipes generally didn't seal their jars in a hot water bath—they often recommended keeping the eggs refrigerated and consuming them within a month. Drat. I have a strong fear of botulism (my dad tries to tell me you can't get it from pickled eggs but I've done my research and a couple people have died of botulism-ed eggs. I think mostly due to inadequately cooked eggs—I think the botulism formed in a slightly uncooked yolk). I somewhat followed the recipe from Putting It Up With Honey, but when it came to the pickling spice part...I was lazy. I improvised the amount for the spices, but here is the rough recipe. 2. While your eggs are boiling, sterilize two 500ml mason jars and lids in a hot water bath for 10 minutes (I always sterilize an extra jar, just in case I need it). Leave them in the canner until you're ready to pack your eggs. 3. Combine vinegar, water and flavourings in a saucepan and bring to a boil. *Hard boil the eggs any way you like, as long as they're cooked all the way through. I followed these instructions for the Perfect Hard Boiled Egg, with the times adapted for my egg size, and I highly recommend them—my whites weren't chewy, and my yolks were bright and creamy. Do I happen to know this person's mom? who! to be honest i thought it was my mom! Pickled eggs good for only a month? Not so. 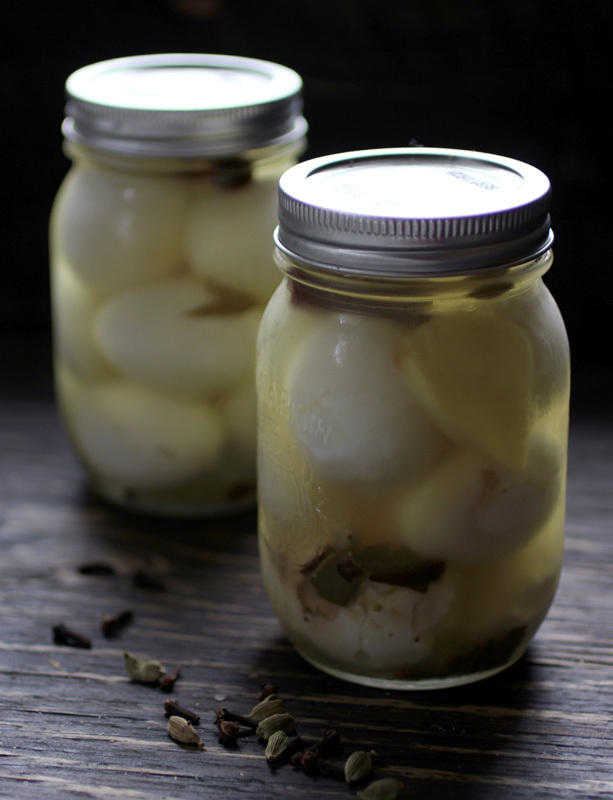 I regularly make a batch of pickled eggs, packing them in sterilized jars and covering with the boiling pickling liquid and spices. I seal them and store in the fridge, and they're still wonderful several months later. I'm not sure exactly how long they can last, but it's more than one short month! You used an interesting combination of spices. Did the eggs come out more sweet or savory? I think that adding some form of heat like jalapenos or crushed red pepper could be good. Do you think that you could make deviled eggs out of the pickled eggs for a twist and interesting taste on a classic? The eggs are definitely savoury...sometimes the vinegar makes my eyes water! The cloves are probably the spice that stand out the most. 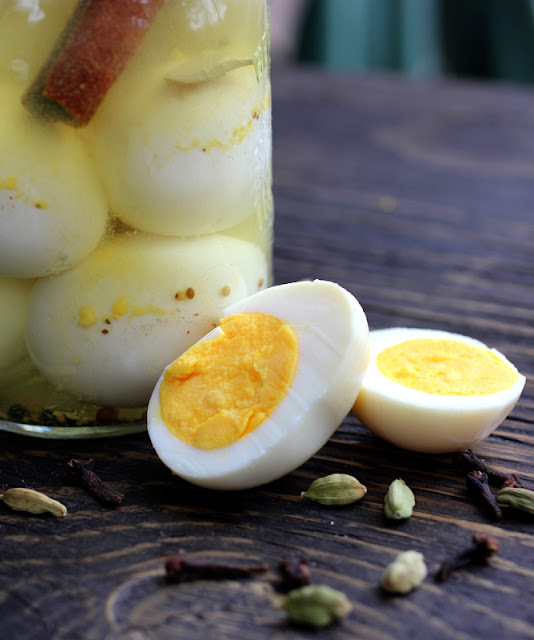 I've read some recipes for pickled, deviled eggs, though I've never tried them. I bet they'd be delicious!